In 1969, in the midst of unprecedented civic unrest in the United States fueled by an imperialistic war abroad and rampant institutionally supported racism at home, the Stooges — a band from Detroit that experienced the riots of 1967 at close proximity — released the song “No Fun.” Maybe it wasn’t meant as a manifesto, but it is hard to imagine a more stark rejection of the “fun morality” of consumer capitalism that was reaching ascendency in the advertising imagery of the era. In this period, lifestyle and luxury magazines championed and illustrated a hedonistic lifestyle that was meant to be both the respite and reward for eschewing political engagement. Corporations were in the process of appropriating youth trends and choreographing them to the program of enforced leisure spending and addiction to ephemeral novelty, labeling shifting fashion winds and permissive personal mores as the real “revolution” that emerging spenders should engage with. Forget civil rights, forget Vietnam, forget feminism: check out this new hi-fi! Smoke this cigarette! “No Fun” says no to that mentality, endorsing through negation a spirit of genuine resistance. The singer of “No Fun” opts to remain “freaked out for another day,” rather than be coerced by the pseudo-pleasures of consumerist conformity, accepting that this condemns him to ostracism and exclusion. Because he recognizes that the “fun” on offer is anything but, he himself will be stamped as unfun, as an apparent narcissist who prefers aloneness and is in “love with nobody else” but himself. But he is willing to wager that the true narcissist is not the refusnik but the one who goes along to get along, who colludes with capital’s demand to find enjoyment in disposability, of products as well as people. As Jean Baudrillard would concurrently note in his study The Consumer Society, “Modern man spends less and less of his life in production within work and more and more of it in the production and continual innovation of his own needs and well-being. He must constantly see to it that all his potentialities, all his consumer capacities are mobilized. If he forgets to do so, he will be gently and insistently reminded that he has no right not to be happy.” The singer of “No Fun,” singing from a rust belt city that saw the birth of assembly-line production and its incipient decay, says no to such mobilization, and chooses three-chord, fuzzed-out monolithic boredom over the smooth seductive sounds of the fun ideology. Given that popular view — that sexual liberation was a sign of material success and cultural cool — popular music sought to provide vicarious access to the swinging life. Hence the emergence of the hot tub genre of pop, sometimes alternately dubbed California Rock or mistakenly conflated with yacht rock (which I have analyzed previously here). Hot tub music typically consists of mellow, often bearded white guys singing about sexual adventurism or its heartbroken aftermath over gently orchestrated, sonically pristine backdrops. Examples include “Moonlight Feels Right” by Starbuck, “Let Your Love Flow” by the Bellamy Brothers, “I’d Really Love to See You Tonight” by England Dan and John Ford Coley, “Baby Don’t Get Hooked on Me” by Mac Davis, “Sentimental Lady” by Bob Welch, “Afternoon Delight” by the Starland Vocal Band, “Magnet and Steel” by Walter Egan, and so on. 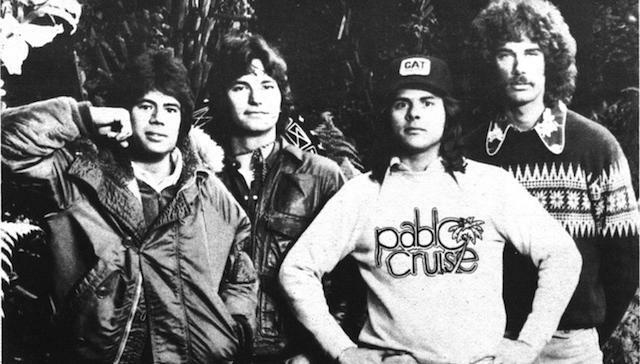 But I would like to focus on one particular exemplar of this genre: Pablo Cruise. This is explicit in the song “A Place in the Sun,” whose lyrics endorse the idea that “everybody’s heart needs a holiday” and that “everyday invites you to find your place in the sun.” That place in the sun is styled as a refuge from the arduousness and frequent disappointment of committed relationships: “Love always promises to last forever, but sometimes it just don’t work out,” the song explains, hence one needs a place where love is supplanted by indulgence (provided you can afford it). This is the essence of “fun,” as it was constructed in the period: a purchased escape from a sense of responsibility to others, with the pleasure emblemized by sexual libertinism serving as justification for any perceived moral lapses. Since other people will no doubt disappoint you with their faithlessness, you may as well please yourself pre-emptively. Moreover, the selfishness of the act will be the index by which you can measure the pleasure it is providing. In The Culture of Narcissism (1979), Christopher Lasch was noting how “the cult of intimacy conceals a growing despair of finding it,” with marital relations becoming difficult to create, let alone sustain, given the self-centeredness of those who might venture into such bonds. “Personal relations have become increasingly risky,” he noted, “most obviously because they no longer carry any assurance of permanence. Men and women make extravagant demands on each other and experience irrational rage and hatred when their demands are not met.” Pablo Cruise had seized upon that “irrational rage” alleged to be in the zeitgeist and turned it into its affective opposite, slick grooves that sought to equate stepping out with chilling out. Pablo Cruise’s first big hit, ”Watcha Gonna Do,” a veritable clone of Boz Scaggs’s “Lowdown,” refines this theme, fully capturing both Lasch’s sense of relationship “riskiness” and Daniel Bell’s grasp of the “fun morality.” Ostensibly a warning offered to a man in a relationship on the rocks to be thankful and appreciative of his partner (“all your friends they’re calling you a fool / ’Cause you don’t know a good thing when you got it in your hands”), it plays more like a teasing question, an invitation to consider all the things he would do once his partner was no longer in his way. ”What you gonna do when she says goodbye? What you gonna do when she’s gone?” Well, you can indulge all the guilt-free promiscuity you want. The song instantiates the cultural contradiction that Bell had pointed to, referencing the “goodness morality” while strongly implying its futility, its outdatedness. The incantation of the title phrase, “Watcha gonna do?” makes it plain that the song takes it as given that she will inevitably go, no matter what. So why not indulge? A similarly cynical blend of sentiments is on display in “Never Had a Love Like This,” which details the ephemerality and uselessness of relationships (“There’s been a hundred if there’s been one, and they have all been nice for a while”) only to claim that the current relationship the singer is in is an exception. Again the message for the listener in this self-negating stew is that love is fickle and uncertain, but self-satisfaction is solid rock beneath your feet, an island in the sun. And the chorus provides the customary reversal, asserting that “once you get past the pain, you’ll learn to find love again,” thus one should “keep your heart open because love will find a way.” Once again, what it means to have an “open” heart is double-sided, inviting the imagination of any number of couplings as love finds its various ways to transpire. Love finds the way, the recipient just maintains a posture of receptive openness to whatever occurs. This basic passivity is crucial to the escapism promised by Pablo Cruise and its hot-tub-rock cohort. What is fun is in part the flight from responsibility, but also, and more important, the assuredness that pleasure will find you without your having to make any effort. Translated into the reality of capitalist life, that means emotional effort can be supplanted by the ease of purchase making. Novel goods that satiate novel desires will find a way, and you can escape the depressing way in which love dims by allowing those new desires into your open heart. Fun, as Baudrillard argued, is always code for a consumer society’s requirement of what he called “universal curiosity,” a hunger “driven by a vague sense of unease” — what today tends to be called “FOMO” or the “fear of missing out.” Fun allows those subject to its tyranny to believe that what is obligatory — fulfilling capitalism’s need for ever increasing consumer demand — is actually an expression of their existential freedom, their liberation: Marcuse’s repressive tolerance under a sunnier mantle, complete with palm trees and an ocean breeze.